Gray anatomy or grey anatomy? 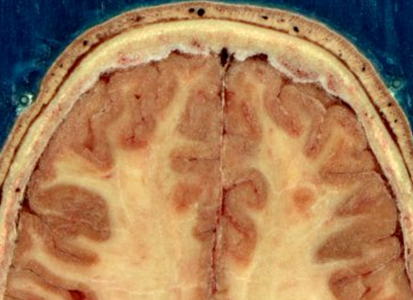 When you are looking at nervous tissue, do you discuss GRAY matter or do you discuss GREY matter? or does it really matter? Yes, it does matter. It depends on whether you are communicating in a United States (U.S.) dialect of English or a United Kingdom (U.K.) dialect of English. Ordinarily, in U.S. English, the color is spelled GRAY. In U.K. English, the color is usually spelled GREY. Actually, in U.K. English, one would state, "the colour is grey" because of the color/colour difference in spelling. But does spelling matter? I say YES. My reasons are spelled out in detail in the article Does Spelling Matter? at The A&P Student. In that article, I discuss the fact that in the health professions, spelling errors are a grave matter of safety. Even small differences in spelling can have unintended, tragic consequences. And that means that during the training of health professionals, we should do all we can to learn how to communicate perfectly—and thereby learn to communicate safely. I'll get back to the importance of spelling in a subsequent article. For now, let's focus on the idea that U.S. and U.K. English have some differences in spelling, a few of which I summarize below. U.K. English is not universal outside the U.S. Some U.S. spellings are commonly (and correctly) used in the U.K. and some U.K. spellings are commonly (and correctly) used in the U.S. Some words in U.S. English that use the e vowel instead use the ae or oe diphthong in U.K. English. Some words in U.S. English that end in -er instead end in -re in U.K. English. Some words in U.S. English that end in -or instead end in -our in U.K. English. Some words in U.S. English that end in -ize instead end in -ise in U.K. English. Some words in U.S. English that end in -yze instead end in -yse in U.K. English. Some words in U.S. English that end in -og instead end in -ogue in U.K. English. Some words in U.S. English have any of a variety of spelling differences in U.K. English. There are many other spelling differences among various dialects of English, but these examples give you sense of the concept. If you are referring to the classic anatomical treatise originally penned by Henry Gray and illustrated by Henry Vandyke Carter, then you should use Gray's Anatomy. If instead you are referring to a television series featuring the character Meredith Grey, then you should use Grey's Anatomy. The creators of this show about medical professionals intentionally played on the popularity of the anatomy reference—but in doing so, probably confused a lot of people!